I really needed a speaking warm up exercise. I had a class of bored older teenagers in a Cambridge First certificate preparation class. They had been working nicely through the units, but I could see they weren’t exactly enthused. I decided I needed a fun warm up activity to try to motivate them a bit – but I didnt want to resort to unrelated random games. A colleague suggested this fun ESL game which worked so well that I used it for my next class (low intermediate level adults). It’s really simple all you need for this warm up activity is a die (I had a huge die – a cardboard box with numbers stuck on it) and a list of 6 topics they have studied already. Write the list of 6 topics on the board and throw the die to a student. If you have done the Dua Lipa PHRASAL VERB warmer in a previous class, or even in this class, you can add ‘relationship advice’ or ‘how to cope with a break-up’ to your list of 6. The student has to talk for 30 seconds about the topic corresponding to the die, you take note and give feedback at the end and the student throws the die to the next person. 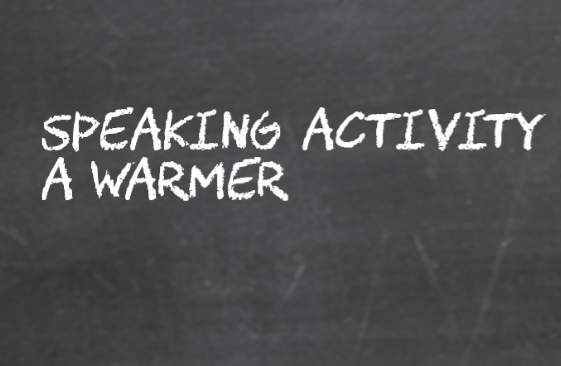 This dynamic warmer worked so well that I used it for my next class – B1a warmer activity for adults. They loved it too!